There is a great legacy of games emulating other games in our industry. Some of the best games ever made are perfections of old techniques or re-imaginings of tried and true concepts. No matter how much some folks try, it’s not illegal and there’s nothing to be done to stop it. Sometimes, the new school does what the old school started, but better. 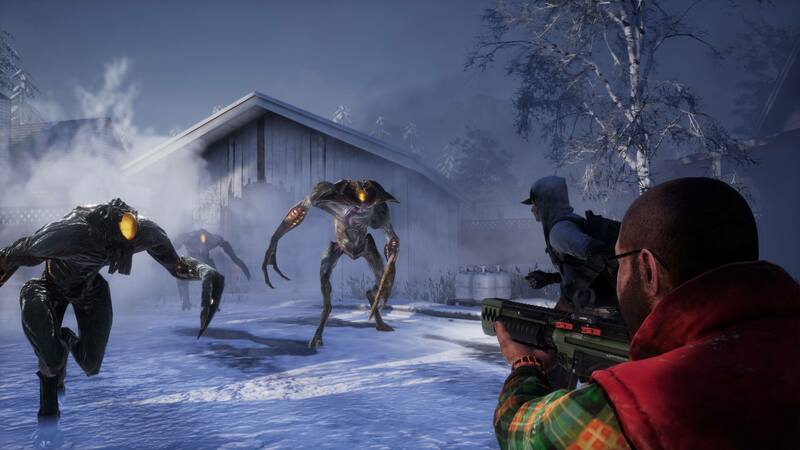 In the case of Earthfall, Valve’s Left 4 Dead has nothing to worry about. Sometime in the near future, Earth is overrun by an alien menace. An eclectic group of folks must work together to push through the creatures and get to safety. Or something to that effect. The actual story is hidden behind lore dumps that are unlocked through play. Like Earthfall’s contemporaries, that’s a bit of a back burner feature. What you’re actually here to do is get a group of your pals together, and rage for a couple of hours. 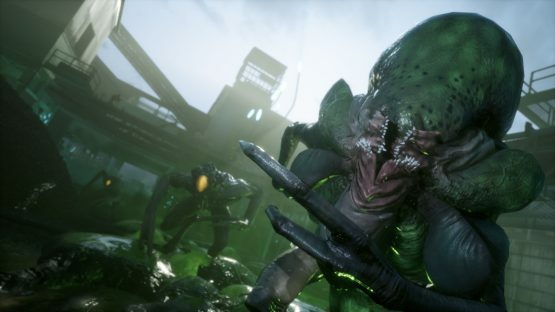 In Earthfall, shooting toothy extraterrestrials while completing menial tasks is the main attraction. Banal objectives include waiting for generators to charge while surviving waves of enemies. Or gathering fuel and trying to start a car while surviving waves of enemies. Or waiting for a door to open while surviving waves of enemies. You get it. I’m sorry. You don’t need too many good reasons to stand back-to-back with your friends and blast the enemy into oblivion. Which is convenient, as Earthfall makes no real effort to give you anything more than the basics. The enemies themselves come in several shapes and sizes, but you reach the bottom of the variety bucket rather quickly. Light and heavy Drone aliens fill the rank and file of the meteor-born menace, running at you mindlessly with tooth and claw flailing. Specialist creatures like Sappers and Enragers will sprinkle in to change up target priorities for a brief second or two. Threshers and Whiplashes appear out of nowhere to disable one of your crew and take them out of the fight without your assistance. Two boss creatures, The Beast and The Blackout, periodically come to make your life harder in missions, and a special monster makes a for a unique final encounter. But you’ll run this full gamut of creatures early into your first map. By the time you finish both stories arcs – a total of ten scenarios – you’ll have seen thousands of these things and the arrival of any one of them will have sufficiently lost their impact. The scenarios are difficult, admittedly. But it’s not because the tasks are hard, or the enemies are smart. There are so many of the monsters, so often. 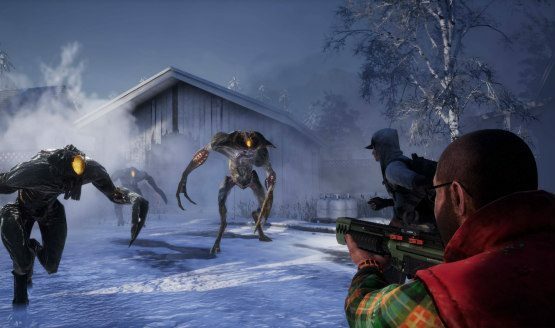 Earthfall makes sure you’ll have something boring to shoot around every corner or every stage. If only the weapons were more fun to use. Pistols feel like hapless popguns, even when dual-wielding them. You can trade them for melee weapons, which are effective killers up close, but lack the kinetic “umph” of hitting something with something else. Bigger weapons like shotguns and assault rifles boom and crackle like guns that copied Call of Duty’s gun’s homework, but somehow still only got a C+ on the test. There aren’t many of these weapons either, but they each do serve unique tactical purposes. There’s a specific use for each of them, and planning your groups load out around each members weapon does show some rewarding results. Repeated play can grant you things like lore, which opens up some insight on the creatures your slaying, the devices you’re using to do so, or the places you’re doing it in. That’s it for real progression variables, though. Characters aren’t unique outside of their model and voice lines. There’s no costumes or skins to earn. Just the option to try missions again on harder difficulties. Even in 2008, the game Left 4 Dead launched with multiple game types. Ten years later, the lack of versus modes or online progression is a head scratcher, when the game you’re aping has been doing those things for years. Presentation wise, the game looks good. The aliens themselves are creative with strong, well-designed visual identities. That said, textures get very flaky when too many enemies crowd the screen at once. The HUD is simple, but markers for objectives can be confusing to find. In a handful of cases, they aren’t there at all. Some missions leave you wandering through the furiously dangerous sectors without any guidance. Maybe good for Dark Souls, but not for Earthfall. The menus are bland, and the overall graphical presentation feels underdone. There are strange quality of life issues present, as well. When playing with a group, I had to mute the microphone of a player in my squad both in the lobby and in game every time we switched between the two. In the three hours it took for me to push through the first set of scenarios, several strange bugs occurred. One caused me to reload endlessly, which disabled my gun. At least it was properly loaded. Earthfall somewhat succeeds at it’s core mission, if it’s mission is to try to kickstart the multiplayer subgenre that Turtle Rock started a decade ago. It’s biggest failure is convincing people that it is a better alternative to Left 4 Dead 2, which is still very available on limited platforms. There’s also Call of Duty’s Zombies/Invasion side modes, which are ubiquitous. Not to mention Vermintide, which is a fresh look at the genre. You will absolutely have fun liberating Earth from aliens with a group of your friends – friends make even the most rote experience interesting. But outside of a few sessions with the group, you’ll all find something better to do. Eartfall review code provided by publisher. Version 1.01 reviewed on a PlayStation 4. For more information on scoring please see our Review Policy here.